"What are the three achievements of the Revolution? Health, education and sports. What are the three failures? Breakfast, lunch and dinner." In the last 15 years, more than a million British tourists have visited Cuba. 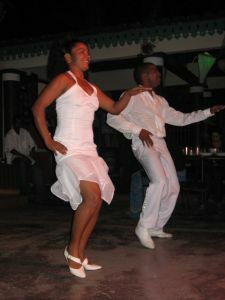 Many of them went to Varadero which is a beach resort on the north of the island, just east of the capital Havana. Anticipating real change in the near future, Roger & Vee wanted to go to Cuba before market forces and American tourists totally change the experience and indeed, just two weeks before our departure, Fidel Castro announced that he was stepping down as the world's longest-serving president after an astonishing 49 years in power. However, we went nowhere near Varadero or any other beach resort because our interest was in the history, culture and politics of the nation. We visited with the company Travel Editions [click here]. Our group comprised a total of 25 people. There were 10 couples - including two brothers with their wives and two sisters with their husbands – and five singles (all women). Except for three in their early 40s, all were aged mid fifties to early seventies. Four of the group spoke Spanish which was a real help. We all got along very well. Inevitably though in such a large group, we tended to split into smaller units for meals and wanderings. Roger & Vee spent a lot of time with Jean-Pierre & Annabell Boulé and Bill & Ann Samuel who were excellent company. Amazingly a colleague of Roger's on the Board of the New National Consumer Council, Stephen Locke, made exactly the same visit a month previously and he gave lots of good advice on things to take and places to go. The best piece of advice was to take domestic items to distribute to Cubans who are really impoverished and we took soap, tootpaste, biros and a few magazines. Roger prepared for the trip by reading the Fidel Castro biography "My Life" [for review click here] and, during the holiday, he read the Martin Cruz Smith novel "Havana Bay" [for review click here]. For Roger, Cuba was his 49th country visited. Cuba is by far the largest country in the Caribbean with a total land area of 111,000 sq km or 43,000 sq miles. The main island – Isla Grande – is about 1,250 km (776 miles) long and on average 100 km (62 miles) wide. This makes it bigger than all the other Caribbean countries put together and around the same size as England. The island was discovered by Columbus in 1492 and ruled by Spain for four centuries until it gained its independence following the Spanish-American War of 1898 (although Britain briefly occupied the island in 1762). The Spanish influence is everywhere, not least of course in the language and the architecture. The first part of last century was dominated by two dictators: Gerardo Machado and Fulgenico Batista. Then came the Cuban revolution in 1959, so we were travelling to the island the year before the 50th anniversary of the event. 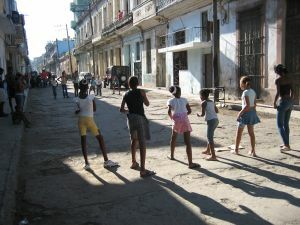 There has been so little economic development since the 1950s that so much of Cuban society seems to be in a time warp. The United States has imposed a trade embargo on Cuba since 1961. In votes in the United Nations General Assembly, only four countries support the embargo: the USA itself and Israel, the Marshall islands and Nauru. The massive economic subsidies from the Soviet Union ended with the collapse of the USSR in 1991 leading to what is called “the special period” when the economy contracted massively and there were terrible shortages and extensive blackouts. The revolution survived, thanks to economic support from Hugo Chávez of Venezuela and more recently some backing from China. There are two currencies in operation in the country: the Cuban peso or peso Cubano (CUP) for locals and the convertible peso or peso convertible (CUC) for foreigners. The standard peso is worth 24 times less than the convertible peso. At the time of our visit, one British pound was worth around 1.8 convertible pesos or, put another way, one convertible peso was worth about 56p. Since 2005, the American dollar has not been a valid form of exchange. The population of Cuba is 11 million. However, there are around 1.3M Cuban Americans – around one in ten of all Cubans - living mainly in Florida. Since the flight from London Gatwick was early on Thursday morning, Roger & Vee spent the previous night at the Sofitel Hotel at the airport and rose at 5.45 am. In fact, our Virgin Atlantic [click here] flight – a Boeing 747-400 – was almost two hours late taking off. This was because we had to wait while “we look for a spare part that is compatible” (scary) which turned out to be a computer component that needed to be driven over from Heathrow Airport (even scarier). In the event, the flight was trouble-free except for regular turbulence. The journey was almost 9 hours and we landed at Havana's José Martí airport at 3.25 pm local time. We were immediately acquainted with our guide Eduardo (an incredibly knowledgeable, informative and likable man), our driver Elais (a very competent former driver with Fidel Casto's bodyguard) and our vehicle (a modern, air-conditioned Mercedes-Benz coach). We were soon at our accommodation in Havava: the Sevilla Hotel [click here] on the wide Paseo de Prado. This hotel is 100 years old this year and represents a homage to Moorish architecture which, over the years, has been visited by a host of famous personages including Josephine Baker and Al Capone. 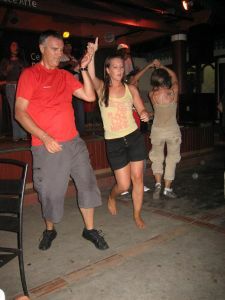 As we arrived, we found that a group was playing Cuban music in the courtyard and we were to learn that everywhere in Cuba – in every bar or restaurant, in every hotel or square – there would be music and often dancing. We were given an hour and a half to unpack and freshen up and then taken out for a meal. 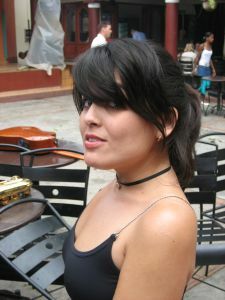 This was at a restaurant called “La Dominica” just off the Plaza de Armas. As we were to find throughout most of our trip, the food was adequate but unexciting. The choice was usually very similar – pork, chicken, beef or lobster – the vegetables were limited and there was an absence of seasoning and variety. Roger loves his desserts and almost invariably there was only one option here: what the Cubans call “flan” but we would call crème caramel. The tour began properly at at 9.30 am on Friday morning. As for most of our trip, it was a hot (low 30sC) and sunny day. Few visitors to Cuba escape without visiting a cigar factory and a rum distillery. This morning, we were supposed to be viewing the Partagas cigar factory but it was busy with tourists (we would visit one later in the tour), so we simply called into the shop (Vee bought a single cigar as a gift for a friend). However, we were able to go Museo del Ron (the Rum Museum) on Calle San Pedro. We were conducted around the fermentation, distillation, filtration, ageing, blending and bottling processes and offered a sample taste of a three-year old rum. Obviously the older a rum the better, but we learned that 6% a year evaporates from the barrels, so there is normally a limit to the ageing process. 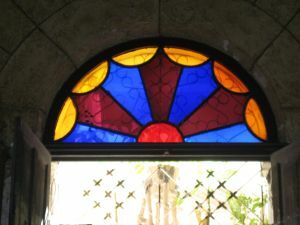 In truth, the building itself is an attraction: a colonial construction with a typical open courtyard and lovely coloured stained glass windows (known locally as mediopunto). 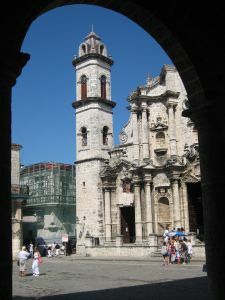 Havana is the capital of Cuba and the largest city in the Caribbean. Around 3M live there – around a quarter of the island's population. 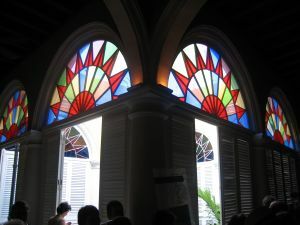 It extends westwards from Havana Bay with the oldest part next to the Bay. Eduardo now took us on a walking tour of Habana Vieja (Old Havana). In recent years, this area – the largest colonial centre in Latin America - has been the subject of a massive renovation project led by Eusebio Leal [click here] and rightly the old town is a UNESCO world heritage site. Many of the streets are cobbled and some are pedestrianised, cut off to traffic by upended old cannon. The doors, balconies and windows are a photographer's delight with scene after scene crying out to be captured. 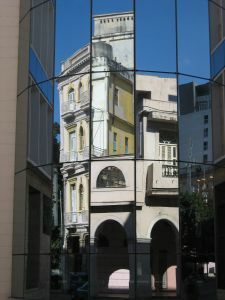 The north-east corner of the quarter is given a special character by a number of impressive squares: Plaza Vieja was originally laid out in 1559, but from the 1950s to the 1990s it was a car park before being restored to its original appearance; the Plaza de Armes was built in the 1600s, is lined with Baroque buildings and enlivened by a second-hand book market; the Plaza de la Catedral dates back to the 16th century, but most of its buildings were constructed in the 18th century, notably the Baroque Catedral de San Cristóbal. The American writer Ernest Hemingway [click here] loved Havana and lived here for 20 years. Initially he settled in the Ambos Mudos Hotel and often drank in the nearby “La Bodeguita del Medio” bar, both of which still feature photographs of the novelist and both of which we viewed. 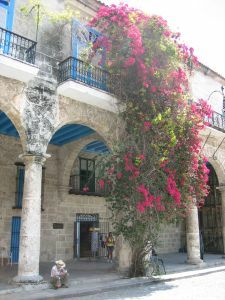 To the west of the district of Habana Vieja is the larger district of Centro Habana and one of the areas of this district is called Buena Vista which is known around the world because of its association with the Buena Vista Social Club [click here]. It was to this area that we now travelled in order to visit a paladar for lunch. 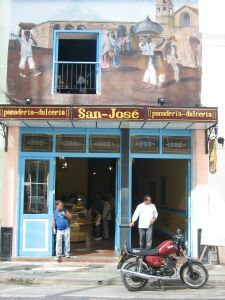 A paladar is a small private restaurant based in someone's home and licensed to provide meals to foreigners for convertible pesos. The name comes from a food-cooking activity depicted in a Brazilian soap opera popular on Cuban television and in turn the word comes from the Spanish word for "palate”. The one we visited was called “Los Cactus de 33” and owned by a guy called Dr Fernando Barral [for biographical details click here]. This remarkable character was a friend of Che Guevara and an early supporter of the Cuban revolution. On the walls of his restaurant is the letter that Che sent to him urging him to leave Hungary and join the revolution in Cuba and a rifle which Che later gave him. As if this was not fascinating enough, Barral interviewed the American senator John McCain during his long imprisonment in North Vietnam [for details click here]. The food with drinks cost us 30 convertible pesos a head – about £17 which would be reasonable for London but represents more than the monthly salary of a typical Cuban worker. We returned to our hotel, driving for a stretch along the seafront promenade known as the Malecón, which was started in 1902 and now runs along the bay for 7 km (4 miles). There are many attractive buildings along the boulevard but a lot need substantial renovation. The ugliest and oddest building is the so-called United States Interests Office which acts as a kind of US Embassy since the Americans do not recognise Cuba for diplomatic purposes [for more details click here]. In January 2006, the Americans began displaying messages on a scrolling "electronic billboard" in the windows of the top floor of the Interests Office. This provoked the Cuban government to erect a large number of poles, carrying black flags with single white stars, obscuring the messages - and they are still there. Back at our accommodation, Roger & Vee went round to a local shop to buy bottled water since we were advised that it was better for foreigners not to drink the tap water. 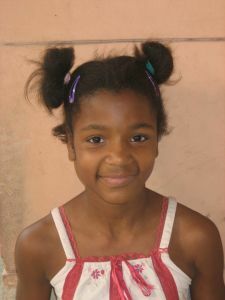 We were followed into the shop by a little black girl with her hair in two pigtails. It was clear that she wanted whatever we were prepared to give her, so we indicated that she should choose something from the shop and she selected a box of Pringles crisps. Back in our hotel room, we found that the chambermaid had left a little note in English and folded our towels into the shape of two swans kissing. We were to find that a note and a towel sculpture was the experience everywhere we stayed which certainly encouraged a generous tip at the end. It had been a full day and we had had a full lunch, so in the evening Roger & Vee contented themselves with a snack in the hotel courtyard listening to music, watching dancers, and finishing with the inevitable crème caramel. In the course of Friday night/Saturday morning, there was a ferocious storm in Havana. In the morning, it was no longer raining but it was overcast and gloomy and, after breakfast, Roger walked up the Prado to the Malecón to photograph the huge waves crashing over the embankment. Today's tourist activities started with us meeting Eduardo in the hotel foyer just before the 10 am opening of the Museo de la Revolución (Museum of the Revolution) which is only a short walk from the Hotel Sevilla. This Neo-Classical building was inaugurated in 1920 and served as the residence for 26 presidents, including the hated Fulgenico Batista [for biographical details click here], until 1965. Clearly it is deeply symbolic that it now houses the official record of the revolution. In a real sense, the revolution began not with Castro's forces but with a failed attack by students on the life of Batista when he was in his office in the presidential palace on 13 March 1957. We were shown his office, his escape route down a corridor hidden behind a large mirror, and bullet holes in the wall. On the ground floor of the building, there is a mural depicting ugly caricatures of George W Bush, Ronald Reagan and Fulgencio Batista. However, on the monumental staircase leading to the first floor, there is a bust of Abraham Lincoln, underlining the point that the Cubans do not hate Americans, but do have a serious problem with most recent US presidents. The Salon de los Espejos (the Hall of Mirrors) used to be the reception hall for the presidents but, on our visit, it was hosting a art display commemorating the 45th anniversary of the coast guards. The second floor gives an overview of Cuban uprisings from the colonial period to the revolution led by Fidel Castro. 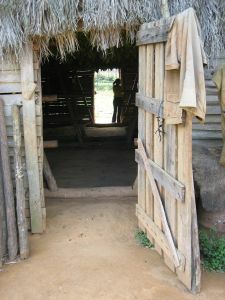 Other rooms chronicle developments since the revolution, including actions against counter revolutionary rebels, most notably the Bay of Pigs invasion [for details click here], and the achievements of the revolution such as the 16 year military support for the independence forces in Angola. All the exhibits are labelled in English as well as Spanish. An especially graphic exhibit is a waxwork tableau of the revolutionary leaders Ernesto 'Che' Guevara [for biographical details click here] and Camilo Cienfuegos [for biographical details click here]. Outside the former presidential palace is a specially-constructed pavilion housing the “Granma” yacht (named after the first owner's grandmother) which in 1956 took Fidel Castro, his brother Raúl and and 80 other revolutionaries from Mexico to Cuba to begin the armed struggle against Batista [for more information on the vessel click here]. Today the official daily newspaper of the Cuban Communist Party is still called “Granma” [for English edition click here]. Around the pavilion are other physical exhibits including Kingfisher and Sea Fury aircraft, a T34 tank, and the remains of an American U2 spy plane that was shot down in 1962. 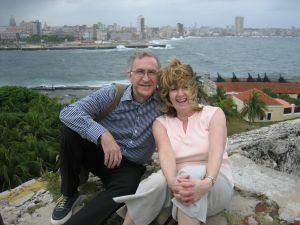 After an hour and a half at the museum, we boarded our coach and were driven to the other (eastern side) side of Havana Bay to view the Castillo del Morro. This was originally constructed as a fortress in 1589 to detect the approach of pirate ships, but today its main function is to house a stone lighthouse built in 1845 and still operating. 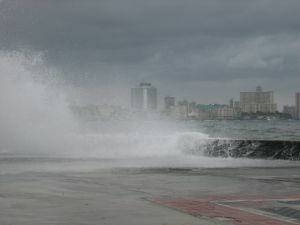 The weather remained wild as we watched the waves crashing over the Malecón and up the bay. 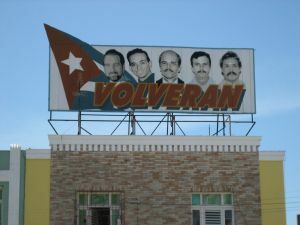 Next we were driven to the Government quarter of the city out west beyond Centro Habana to the district called Vedado. This quarter is dominated by the Plaza de la Revolución. 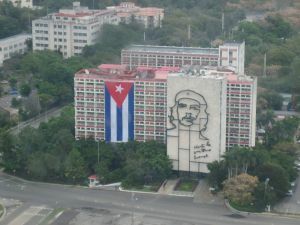 Although the square was designed in 1952 under the Batista regime and most of the buildings visible today date from the 1950s, the square was renamed following the revolution led by Fidel Castro. It has been the venue for many mass rallies and military parades attended by over a million people and frequently (often at great length) addressed by El Commandante (his longest speech was 7 hours and 10 minutes in 1986 at the Third Communist Party Congress in Havana). The square is overlooked by the towering Memorial José Martí, construction of which started in 1953 on the 100th anniversary of the birth of Cuba's national hero [for biographical details click here]. The grey marble memorial was finished in 1958 and stands 109 metres (358 feet) high in the shape of a five-pointed star. We went to the top for great views over the city from windows in each side of each point of the star, most dramatically the Ministerio del Interior which stands directly opposite the Marti memorial and is almost completely covered by a huge bronze wire sculpture of Che Guevara completed in 1995. It was time for lunch and we visited another paladar. This was a place called “El Palio” next to the bay in the Miramar district. As well as very friendly service, we had the best dessert on offer during our trip: a delicious chocolate concoction. Even though it was a bit cheaper than the previous day's paladar, we still spent on each meal the equivalent of a Cuban's monthly salary. We were back at the Sevilla Hotel at 5 pm (this time our towels looked liked elephants but what we thought were chocolates for eyes were simply plastic tops). Now, while we were at the Hotel Nacional, we had learned that there was to be a performance that night of the Grupo Company Segundo [for the Myspace page click here] and many of us were excited at the prospect of hearing music to have come out of the Buena Vista Social Club, so 20 of the 25 in the group – including Roger & Vee – organised to return to the hotel for the performance (cost 25 convertible pesos or around £14 each and then those cocktails of course). It was a fabulous evening with Grupo Company Segundo – a nine-member ensemble – performing for almost two hours of exciting music. For four numbers, we were treated to a wonderful display of salsa dancing by a black couple who wore different coloured outfits each time. They were so sinewy and graceful and dazzled with their footwork. Sunday morning was our third and last in Havana for the time being and, since we were leaving the city in mid morning, there was not much time to do more. 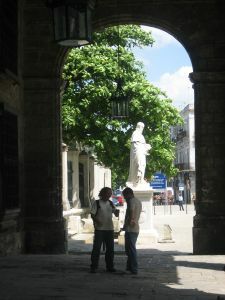 In fact, Vee was happy to stay in her room and prepare for the journey, while Roger took the opportunity to visit one more feature of Havana: the nearby Museo Nacional de Bellas Artes (National Museum of Fine Arts). The building was constructed in 1954 and (like the Guggenheim in New York) one starts at the top and works down. The museum contains Cuban art by the likes of Wilfredo Lam [for biographical details click here] and René Portocarrero [for biographical details click here] and, in the central courtyard, school children were engaged in a dancing display. It was 11.30 am on Sunday morning as we left our hotel in Havana and our coach took us out of Cuba's capital east to the A1. To the Cubans, this is a freeway. To the group, it was a freeway only in the sense that it was free of so many things one associates with a motorway in Britain, so no central reservations, no road markings, no speed restrictions, no restrictions on vehicle types, virtually no petrol stations, even fewer service stops, and amazingly very few vehicles. What the Cuban freeway had that a British motorway does not is regular clusters of people seeking lifts, not just at junctions but all along the route, plus frequent police check points. Eventually we turned south to enter a region called the Zapata Peninsula, named after the landowner who was granted the land by the Spanish crown in 1636. This is one of the least populated regions of the island, because most of it is swamp, but this makes it one of the best wildlife reserves in the Caribbean. We drove through what was once a batey or sugar workers' town [click here] but is now a ghost village. This is one of 74 in the country – communities where sugar mills were closed down for economic reasons but no alternative employment was provided. We passed through a another such community called Central Australia which was the location of the headquarters of the Cuban armed forces in the Bay of Pigs conflict in 1961 (the Bay of Pigs – or Playa Girón in Spanish – is on the southern edge of the peninsula). In this case, the the former sugar refinery now houses a small museum commemorating the Bay of Pigs incident. Also in evidence were various memorials to soldiers killed in the conflict. Eventually we reached our destination on the peninsula: a place called La Boca which is home to the Criadero de Cocodrilos or crocodile farm. 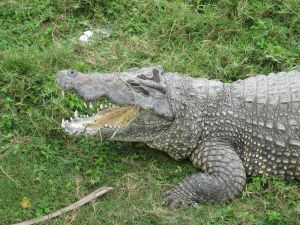 We started with lunch and some of us – including Roger & Vee – had crocodile which looks like fish but tastes more like chicken. It was accompanied by the appropriately-named yucca plant. 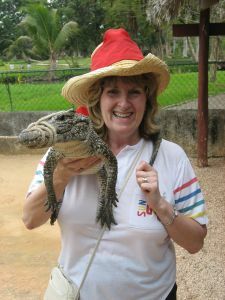 We then had a tour of the farm and Vee – who knows no fear - took the opportunity to handle a four-year old crocodile. After a couple of hours at La Boca, we returned north to the A1 and continued on our easternwards journey, observing cane harvesting accompanied by swarms of egrets. Our base for the next few days was the maritime town of Cienfuegos (literally 'one hundred fires') on the south coast of the island. The first town was founded here in 1819 and the place was named after the Cuban Governor-General of the time. Known as “the Pearl of the South”, the loveliness of the bay is marred only by a half-built nuclear power station. We had been told that we would be staying in the Union Hotel, a delightful place opened in 1869 and located in the very centre of the town, but this is still a country where all hotels are state-controlled and, when we arrived there, we were told that we had been reassigned to the Hotel Jagua [click here], well-positioned by the bay on the outskirts of town but lacking the character of the Union. It was 5.20 pm when we arrived at our accommodation, so most of the day had been travelling from Havana to Cienfuegos, and all we did that evening was enjoy some cocktails and the hotel buffet. 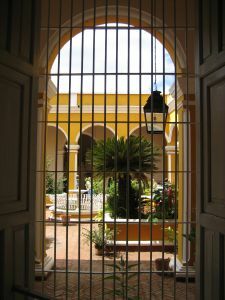 Monday was a day trip to the colonial town of Trinidad and the weather was now sunny and hot again. It was a one and a half hour journey to Trinidad and, while the road was only single lane and not in the best condition, there were some fascinating sights, ranging from a buffalo farm, scrimp farms and cowboy horse riders to the Karl Marx cement factory. The most amazing sight was thousands of red crabs scuttling across the road attempting to return to the sea having laid their eggs in the shrub lands on the far side of the road. There was simply no way that our coach or any other vehicle could skirt around such a huge number of small crabs and consequently the tarmac was covered in red stains. Trinidad was simply wonderful. Founded in 1514 by Diego Velázquez and once a major centre for trade in sugar and slaves, this is now one of the best preserved colonial cities in the world, the colonial gem of the country, and since 1988 a UNESCO world heritage site. The original cobblestone streets and the pastel-coloured houses - all pink, pistachio, and pale blue – make this an evocative throw-back to colonial times. 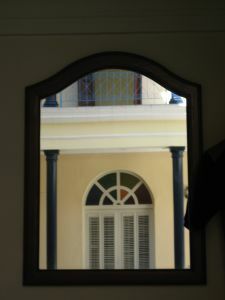 Some of the most distinctive features of the local colonial architecture are the doors and the windows. 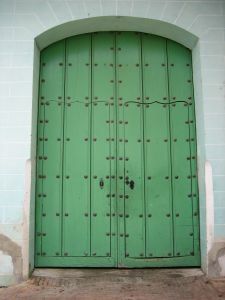 The doors are huge and designed to permit access by a carriage or horseman but, cut inside them, one or two smaller doors are for use by people on foot. The windows are almost the height of the doors, have wooden shutters instead of glass, and ornate iron grills. Our guide Eduardo took us on a walking tour of the old city. First, we called into a 'shop' responsible for allocating the monthly food rations in accordance with the entitlements laid out in the ration books owned by every Cuban. The food is enough for about one meal a day, so nobody starves but equally nobody can survive simply on the state rations. This 'shop' contrasted totally with our next port of call: the Palacio Cantero. This Neo-Classical gem was built in the early 19th century and is now the home of the municipal museum. After looking round the palace, we walked up to the sloping Plaza Mayor, a splendid square surrounded by impressive colonial buildings, most notably the Iglesia Parroquial de la Santísima Trinidad (Church of the Holy Trinity) which was completed in 1892. 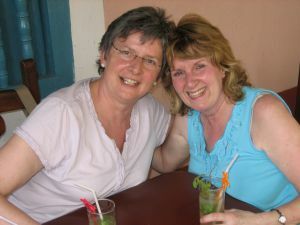 We were supposed to be going to a bar for a free drink but, just off the main square, we came across another bar – the "Palenque de Los Congos Reales" - and, before we knew what was happening, we had sat down for cold drinks and were being entertained by a local theatre troupe. Inevitably there was music and just as inevitably there was dancing. Half a dozen members of our group – including Vee – were persuaded to join the dancers on a little stage and we could have stayed there all afternoon having fun. But our free drink awaited. This was at a place called "La Canchanchara", an 18th century building known for its namesake cocktail which is made of rum, lime, water and honey. Of course, there was more music to entertain us as we sipped our cocktail. Eduardo gave us all a couple of hours to find our own lunch and explore the city further, so we split into little groups, Roger & Vee making up two of “the mojito six”, the others being Jean-Pierre & Annabell Boule and Bill & Ann Samuel. We had a light lunch together at a restaurant called "Meson del Regidor" where the friendly English-speaking woman serving assured us that everything was "the best in town". After the meal, we further divided into gender groups. The women went shopping in little craft markets, while the guys did some more sightseeing, revisiting the Palacio Cantero to climb to the top of the tower for some great views, looking inside the courtyard of the 1812 Palacio Brunet (which was officially closed), and visiting the Museo de Arquitectura Colonial, an 18th century mansion housing such delights as a 19th century shower with a complicated network of pipes. On their separate meanderings, Roger & Vee started to hand out soap, toothpaste and biros which were always received with pleasure and appreciation. Our coach left Trinidad at 3 pm after an all-too-short visit of four and a half hours. 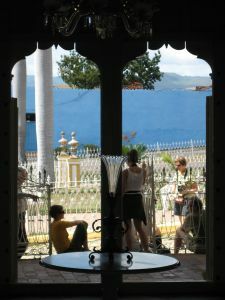 Back in Cienfuegos, Vee returned to our hotel, but the remainder of “the mojito six” jumped off the coach as it passed through the town so that we could look around a while. First we went to the Union Hotel for a drink, managing to sit out a brief thunderstorm. Then we wandered around the Parque Martí, a vast square of 200 metres by 100 metres (655 by 330 feet) which has been declared a national monument because it is bordered by so many historic buildings. We visited one of the buildings, the Teatro Tomás Terry which was built in 1886-1889 and named after an unscrupulous sugar factory owner. Although it took half an hour or so, we walked back to our hotel along the splendid Paseo de Prado which was laid out in 1922. The entire group was having a special dinner in a special location next to our hotel, but first “the mojito six” met for a cocktail in the wonderfully named “Covadonga” bar opposite the hotel. The dinner was in the Palacio de Valle built in 1913-1917 and named after a sugar merchant. It is lavishly decorated with Gothic, Venetian and Neo-Moorish motifs and has three towers of different designs symbolising power, religion and love. After a meal centred on a fish dish and much conversation, the six finished up on the open terrace where we each had another couple of mojitos to conclude another fun day. Next morning (Tuesday) it was another 9 am start for another trip on another hot and sunny day. This time we travelled north-east to the city of Santa Clara. This was founded in 1689 but the most famous historic event to occur there took place in 1958 and effectively brought about the overthrow of Batista. It only took an hour and quarter to reach the city and near its centre the Tren Blindado Monument (the Armoured Train Monument). In this city, Che Guevara led a force of just 400 men and captured the place from 3,000 of Batista's forces and then the following day, 28 December 1958, derailed an armoured train that was supposed to transport 400 soldiers to the eastern region of Cuba to block the advance of the rebels [for more information on the Battle of Santa Clara click here]. The sculpture incorporating four of the actual wagons involved is located on the very spot that the incident took place. After half-an-hour here, we travelled on to Conjunto Esculfórico Comandante Ernesto Che Guevara in the Plaza de la Revolución. 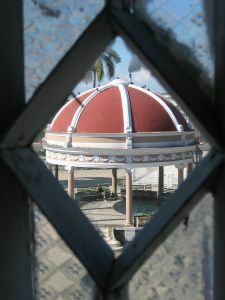 This was built to commemorate the 30th anniversary of the Battle of Santa Clara at the end of 1988. It is part monument and part museum. 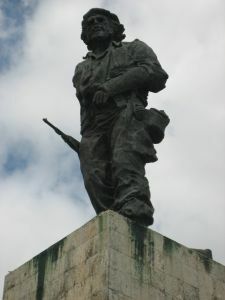 The monument is topped by a bronze statue of Che with his arm in plaster and beneath it a bas-relief depicts scenes from the battle and the words he wrote in his farewell letter before leaving for Bolivia where he was captured and killed. The museum has a variety of fascinating exhibits and striking photographs [for an account of Che's life and death click here] but everything is labelled in Spanish only. In 1997, the remains of Che and those accompanying him on the ill-fated Bolivian mission were returned to Cuba and they are now set in a wall inside a dark, musty room attached to the museum with Che's final resting place identified with a star of light. Visiting this memorial is a weird experience. 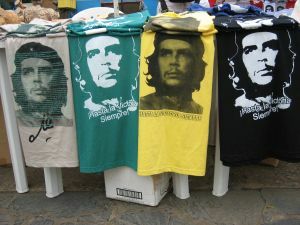 On the one hand, it is politically fascinating because Che Guevara is such a charismatic and iconic historical figure. On the other hand, it is unsettling, partly because it is the pinnacle of an excessive cult of personality around Che and partly because we now know that Che was an arrogant and cruel man as well as an idealist revolutionary. 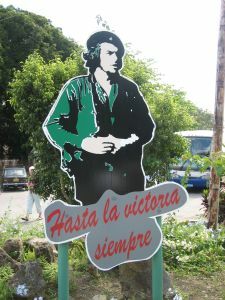 To visit Che's tomb in Santa Clara is to experience something quasi-religious that Roger could only compare to observing the embalmed bodies of Mao Zedong and Ho Chi Minh in Beijing and Hanoi respectively. However, Vee has always had a special affection for Che because he was a serious asthma sufferer and her brother died of asthma. After an hour at the memorial, we returned to Cienfuegos where Roger & Jean-Pierre jumped coach to spend more time in the town, a couple of hours enhanced by the much sunnier weather than on our last look around. We revisited the Parque Martí and went into the Catedral de la Purísima Concepción constructed in 1833-1869. After some lunch in the Union Hotel, we returned to the square and looked around the Museo Provincial which has some lovely exhibits. Towards the end of our time in the museum, we heard music and singing and were surprised and delighted to find that it was coming from a male guitarist and a female singer on the ground floor entertaining a group of schoolgirls. We sat and listened to this exquisite performance and were near to tears with pleasure. 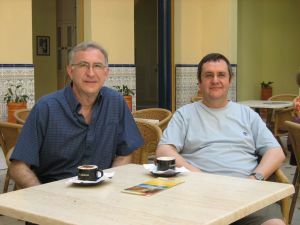 Roger & Jean-Pierre walked all the way back to the Jagua Hotel on the edge of town, but stopped at the Club Cienfuegos, partly to have a beer overlooking the bay and partly to check out the place as a suitable venue for dinner that evening. In fact, “the mojito six” duly had dinner there and, as the drink flowed, Annabell demonstrated why her nickname is Decibel. Afterwards Bill & Ann returned to our hotel, while Roger & Vee and Jean-Pierre & Annabell took a horse and carriage into town to retrieve a map of Cuba that Roger had left at the Union Hotel in the afternoon. The return journey in another horse and carriage proved eventful. The driver spotted a police car and suddenly left the main road and took a back street towards our hotel. Clearly, however, the police had spotted him because they cut us off a few minutes later and established that our carriage driver did not have a licence to carry foreigners and removed his ability to work for 30 days. 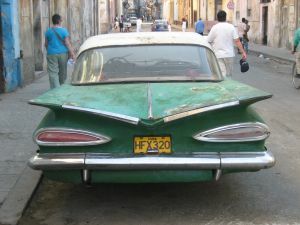 We felt so bad about this that, as well as the fare of four convertible pesos, we gave the driver 20 more (equivalent to an average Cuban's monthly salary), bringing him near to tears. After three nights in Havana and three nights in Cienfuegos, we were off to the far west of the island for three nights in Viñales for the third and last leg of our trip. It would take most of the day (Wednesday) to make this coach journey so we set off at 9 am and started by returning to the A1 so-called freeway. After a couple of hours on the road, we stopped for a break and a drink at a rare service facility with the prosaic name “Kilo 104 on A1”. 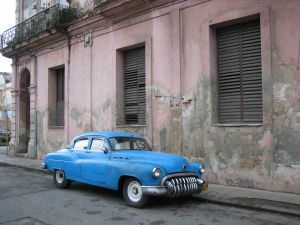 Instead of going into Havana, we simply skirted the capital and kept on westwards on the A4. Around lunchtime, we turned off the freeway and headed the short distance northwards to an eco-reserve called Las Terrazas. This is one of a number of communities in the Sierra del Rosario founded by a government programme in 1968. The name derives from the terraces laid out for the pine trees that are now a characteristic feature of the area. 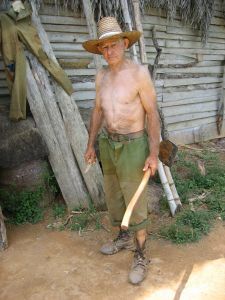 The 1,000 inhabitants make a living by maintaining the woods and from eco-tourism. There was only really time for a sandwich and a coffee and short walk around since this was as much a comfort stop as sightseeing. For walkers and birdwatchers, this would be a good place to spend a couple of days but, as the weather clouded over, we were off again, returning to the freeway and continuing west. It was soon raining heavily. It was 4.30 pm – after a journey of seven and a half hours - when we reached our destination: Hotel La Ermita [click here] just outside the town of Viñales. The location of the hotel is stunning, overlooking the Valle de Viñales with its characteristic red earth and giant mogotes. A mogote is an ancient rock that was once part of a limestone plateau before, over a period of million of years, underground aquifers eroded the softer limestone, leaving only the hard limestone pillars – resembling sugar loaves – that stand today like stone sentinels keeping watch over the corn and tobacco fields. Many of us were ready for a cocktail or two before we even bothered to unpack and Vee downed a couple of mojitos and Roger had a Cuba libre, only then resting in our room, located in one of the two-floor units scattered around the open air swimming pool and other facilities. We all had dinner in the hotel restaurant. There was then a small show by the pool and bar in which we were introduced to the gods of the local religion called santería [for an explanation click here]. This was brought from Nigeria to Cuba by the Yoruba slaves and manages to co-exist with the Catholicism brought to the island by the Spanish colonialists. The main santería god is Olofi, the creator divinity, similar to the God of Christianity. Another santería god is Ochun, the goddess of love. All this was explained in a performance which included music and fire-eating. Thursday morning started with a morning coach tour of some of the sights of the Viñales Valley. 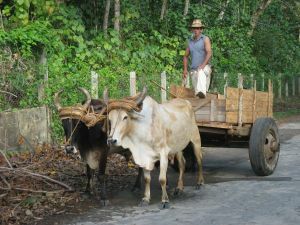 We left the hotel at 9 am but soon called on the coach to stop so that we could photograph two oxen pulling a cart down the road (Eduardo and Elias seemed bemused by this but it is not a sight one sees in Britain). We headed to a place called Colsolaciön de Sur - near to the location of the Soviet missiles of 1961 – and visited the local cigar factory called ”Paulina Pedroso” (where we were not alowed to take photographs). There are 32 brands of Cuban cigar on the market today but any factory can make any brand. 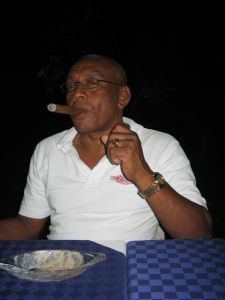 Apparently it takes six months training to learn to roll a cigar to the required standard and then the average worker rolls between 50-100 a day. Everywhere one goes in Cuba, one is offered cheap cigars (often rejects) and, even as we went round this factory, workers offered under-the-counter deals. From the factory, we headed over to the Hotel Los Jazmines from which there are wonderful, panoramic views over the valley with its striking mogotes. Next we drove down into the valley to call into a private tobacco farm called Casa de Vegeros where we looked inside a hut for drying the leaves. 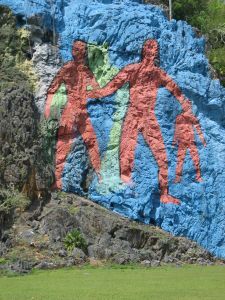 Then we moved on to Mogote Dos Hermanas where the Cuban painter Leovigildo González created a pictorial history of evolution from ammonites through dinosaurs to a human family - surprisng colours on a towering rockface. He created this huge mural in 1959-1962 and it was restored in 1980. 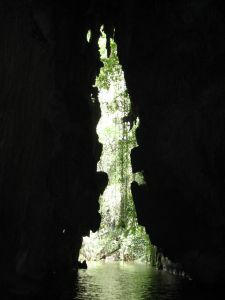 Our final visit was to Cueva de Indio, a limestone cave discovered in 1920 which we toured on foot and then on a small motorboat. 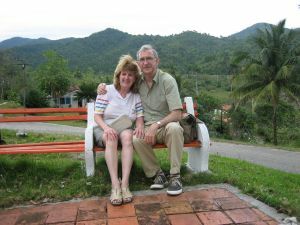 The trip was over and the coach returned to our hotel, but Roger & Vee together with Jean-Pierre & Annabell left the vehicle as it passed through Viñales so that we could spend some time in the little town. It was actually founded as long ago as 1607 and derives its name from a vineyard planted by a settler from the Canary Islands Today it is the subject of government protection as an example of a perfectly preserved colonial settlement. In a corner of the main square – another Parque Martí – we found a great place called “Polo Montañez”, part restaurant, part bar, part night club. We had an excellent lunch of pork brochette with rice and black beans plus salad. A musical group called “Valle Son” [click here] entertained customers and we enjoyed the music so much that we bought their CD which they each signed. What was most special was the spontaneous way in which local customers simply stood up from their tables and danced in their private world – and did it so gracefully. Afterwards the four of us wandered around the town and Roger dispersed more soap to invalids. After a couple of hours back at the hotel, it was an evening on the town. For this “the mojito six” joined up with Juan-José Alamo (Spanish) and his partner Joanne Miles plus our coach driver Elias. In Viñales, we ate at what is the only real restaurant in the town, a place called “Casa de Don Tomás”. This is described in one guide book as “a minor architectural gem” since it was built in 1887-1888 for a rich merchant and restored in 1991. Vee ate the house special which the same guide book asserts “is not for the faint hearted” (it is a weighty combination of meats and rice). At the end of the meal, Jean-Pierre started a Cuban cigar that he had purchased earlier and both Vee and Elias took turns. Then we strolled back to our lunchtime venue, the “Polo Montañez” where we spent a very happy two and a half hours. The town of Viñales was hosting a dance carnival that weekend and this evening was the kind of warm-up. So, out in the main square, a powerful sound system blasted out dance music while, in our club, we listened to live music and watched some great dancers, including a magnificent black dancing teacher whose incredible moves included a slow splits. We walked back to the hotel – it took around 20 minutes – along a country road with no pavements and no lights (fortunately we had torches) and reached our beds around 1 am. Next day (Friday) was the one free day of the trip. A day trip to a special beach – the unspoilt Cayo Jutias – was available for purchase and a number of our group took up this chance to sun bath and swim, but Roger & Vee are not beach people, so we stayed on at our hotel and had a thoroughly relaxing day resting and reading and (in Roger's case) swimming in the pool. The “mojito six” were reunited for the evening. 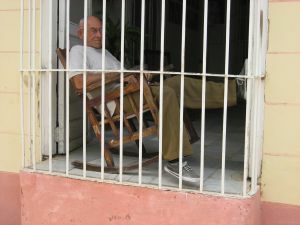 In Havana, we had enjoyed the opportunity to eat in some private homes acting as a paladar and, while officially this sort of facility is not available in this part of Cuba, we had heard of a nearby farm where we could have an illegal meal. We had to meet our contact at a precise time and place, so that we could be guided by a battery-operated strip light down pitch-black paths to the farm, and we had had to give advance notice of what we wanted to eat, so that they could go out and buy the food and have it cooked when we arrived. It was a delicious meal and we finished it with the best pineapple we had tasted in Cuba – but it was not cheap. After dinner, Bill & Ann returned to the hotel. Jean-Pierre & Annabell joined Roger & Vee in a second night at the “Polo Montañez” but they were tired after their day at the beach and did not stay too long. It was the main day of the dance festival and the little town was in a great state of excitement. The main road was cut off to traffic, lots of stalls sold food and drinks (several had a full roasted pig and one had given their dead animal a pair of sunglasses), and the main square had a special two-tier stage on which scantily-clad young women danced to the thumping beat of the sound system. Inside the “Polo Montañez”, there was live music from a different group but many of the same customers on the dance floor as the night before. The atmosphere was intoxicating (and the cocktails helped) so that, towards the end of the evening, it was impossible simply to watch events. Our driver Elias turned up and Vee danced with him. Roger thought that he could escape the salsa but a blonde Spanish-speaking woman dragged him on to the dance floor, turned her back on him, and pushed into his groin. What was a man to do? He let the son music guide his rhythm, forgot that he was British, and did his bit for international relations. As soon as Roger & Vee left the club and encountered the slightly more sober atmosphere of the main street, it became clear that Vee had consumed more mojitos than she had realised and was having trouble staying on her feet. The walk back up the hill to our hotel took twice as long as the night before as Roger endeavoured to pull Vee in a standard direction. At one point, she fell over so many times that a young couple appeared out of the blackness to inquire in Spanish if Roger was assaulting Vee (he tried to explain that everything was “normale”). Eventually Roger managed to maintain Vee in a consistently vertical position and to point the way ahead with a torch but, when they were joined for one stretch of the road by two old local drunks, he was unable to preserve Vee's dignity as her bottom was fondled by one of men who took a particular fancy to the very happy British lady. It was 2 am before Vee was able to crash on to the bed and next morning she was delighted to find that seemingly one can drink as many mojitos as one wants and not suffer a hangover. 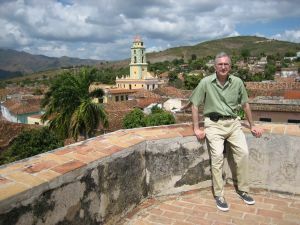 It was Saturday morning and, after three nights in Viñales, we were driving back to Havana. Jean-Pierre and Bill had formed a two-man politburo and informed Roger that he had been selected to deliver a message to members of the group so, before the coach left the hotel, our guide Eduardo and our driver Elias were asked to leave the vehicle for a few minutes, Roger was given the microphone, and he announced suggestions for tipping Eduardo and Elias and urged colleagues to donate unwanted clothes and unused medications that could be given to deserving and needy Cubans. We left the hotel at 11.10 am and headed east back to the capital, entering Havana through the western-most districts of Siboney and Cubanacan. 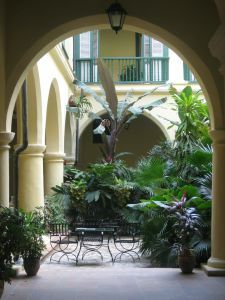 These are beautiful parts of Havana with splendid homes, attractive parks and a convention centre. One then comes to the district of Miramar, one of the most elegant parts of the city, centred on the busy Avendia 5. Finally, driving through Vedado & Plaza and Centro Habana & Prado, we were back at the Hotel Sevilla at 12.50 pm. 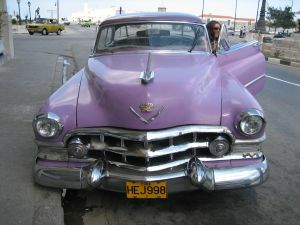 The group had the afternoon free, so “the mojito six” walked up a bustling Prado to a restaurant called “Prado 12” for lunch in the sunshine served by an English-speaking waiter who was very proud of his purple 1950 Cadillac parked outside. We were within sight of the Malécon and the sea and we noted the passing by of men planning to fish in the inimitable Cuban style sitting in an inflatable inner tube covered in netting (these men are called neumaticos). Later in the afternoon, Roger went out with Jean-Pierre & Annabell to explore Havana further. We been shown the political and tourist quarters and the oldest and the most elegant parts of the capital, but the three of us wanted to see the 'real' city where ordinary people live. So we took a taxi west and asked to be dropped on the furthest edge of Centro Habana. We then walked back to the hotel but in meandering fashion, wandering up and down streets of this working-class district as the fancy took us. We accidently came across a remarkable street called Callejón de Hamel in the Cayo Hueso quarter which is a curious open-air Afro-Cuban sanctuary named after a French-German resident called Fernando Hammel and painted by Salvador González. Mainly though this was Havana in the raw: crumbling apartment houses lining dowdy streets with minimal traffic but lots of human activity. It was clear that these people live by or on the street: lots of people sitting on balconies and in windows or standing by open doors just watching the comings and goings of the neighbourhood; men in vests sitting around a table playing dominoes, or hunched over a 1950s car engine trying to make it work, or pulling old electrical appliances on makeshift barrows; children playing baseball but with no proper bat or ball, still less a leather catching glove, but improvising with sticks and bottle tops. Just about everything seems to happen on the street – we even saw a woman having her feet washed by a friend. We gave her some soap and took other opportunities to hand out more soap, toothpaste and biros until we had exhausted everything we had brought from Britain and 'liberated' from the hotels. 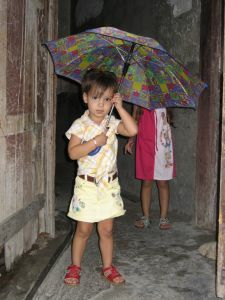 Occasionally we would see someone dressed from head to toe in white, perhaps even carrying a white umbrella. These characters were aspiring priests of the santería religion (their initiation includes an entire year dressing solely in white). Eventually we were back in the area near our hotel where the skyline is dominated by the dome of the Capitolio which was inaugurated in 1929 and was the home of the Cuban government until 1959. Nearby is the Hotel Inglaterra which dates from 1875 and is built in the style of late 19th century Havana Neo-Classical architecture. We took the lift to the roof for good views over over the centre of the city. That evening, our last of the holiday, we had our final meal as a group in the "Cafe de Oriente" in Plaza de San Francisco by the bay. It was a three-course dinner, concluding with the inevitable crème caramel. The resident band was playing cover versions of Western contemporary music until Annabell asked them to play some Cuban jazz which was much better. As requested, Roger made a short speech of thanks and presented envelopes of tips to the guide Eduardo and the driver Elias. After the meal, some of us were not ready to conclude the evening, so “the mojito six” - plus Juan-José & Jo (celebrating their 16th anniversary) – found a bar called Tabarna del Muralla in Plaza Vieja and downed a few more mojitos and Cuba libres. 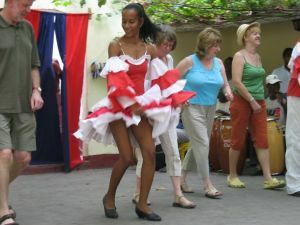 As everywhere in Cuba, there was music and often diners would dance the salsa in a wonderful piece of street theatre. Sunday morning dawned bright and sunny and our departure was now only hours away, but Roger was determined to have one last look at Old Havana, so he went out for just over an hour to soak in the atmosphere one last time and take yet more photographs (his total exceeded 400). 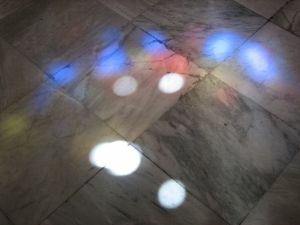 He walked down the street called Obispo, around Plaza de la Catedral, and back along the street called Tejadillo. Calle Obispo (named after the city bishop) is the heart of the historic quarter and beautifully restored with elegant shops, while the cathedral had a mass for Palm Sunday and some observants were carrying palm leaves. At the airport, there was a 70-minute queue to check in, then we had to pay 25 pesos (about £14) each as a departure tax, and finally the flight was delayed by around two hours – but all this did not matter because now we were among friends and we had much about which to reminisce. Cuba has an unusual political system with a National Assembly of 614 chosen in 'elections' in which there is only one candidate for each seat in the parliament. After 49 years at the helm, as a result of serious ill-health veteran leader 81 year old Fidel Castro has been forced to pass power to his younger (by five years) brother Raúl. 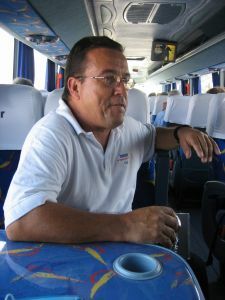 The unofficial head of the opposition in Cuba itself is Eloy Gutiérrez-Menoyo, a former commander in Castro's army who was jailed for 22 years [for more information click here]. 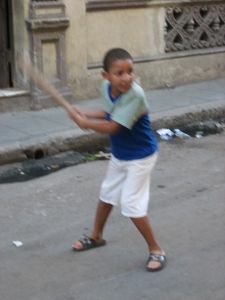 There are many criticisms that can be made about Cuban society, many of which derive from the nature of the Communist state and some of which are a consequence of the US trade embargo. Politically it is a one-party state that allows no genuine opposition, no independent trade unions and no independent media. There is colossal bureaucratic incompetence and widespread, small-scale corruption. According to Amnesty International, the country has at least 70 political prisoners. The death penalty remains in operation. Economically the country is suffering from food and other shortages, a serious housing shortage, a chronic lack of transport, and regular power cuts. The most serious need for reform is in the area of agriculture. Cuba imports 80% of its basic food with a third coming from the United States which exempts food from its economic embargo. These imports cost £800m annually, a drain on state resources which is set to worsen as global prices rise. Yet the Cuban Revolution has many merits to its credit. It has dramatically lowered infant mortality and significantly raised life expectancy. It has abolished illiteracy and brought about a massive improvement in educational achievement. The health service is enormously impressive and the country has loaned many doctors to other countries around the world. Child care is excellent, crime levels are low, and drugs are not a serious problem. The most visible manifestation of the revolution to visitors is the total absence of commercial advertising and instead the frequent display of political imagery and propaganda. 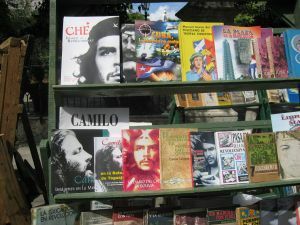 Although pictures of Fidel Castro himself are not that prevalent, busts and statues of José Martí are everywhere and there is a massive cult of the personality around Che Guevara with lots and lots of photographs and murals and books. 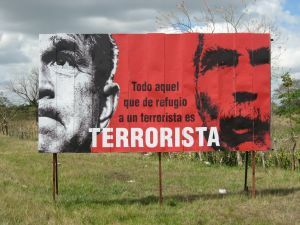 Another frequent image is that of the so-called 'Cuban Five' [for further information click here] and there are also posters showing the Cuban terrorist Posada Carriles [for further information click here]. The future of the Cuban revolution post-Fidel is the subject of great speculation. Cuba might lunge into free market capitalism and experience the sort of shocks and inequalities suffered by Russia. Or it might follow the Chinese model and introduce economic liberalisation while retaining tight political control for the communist party. Or it could follow the Hungarian model where the local communist party introduced both economic and political reforms which eventually led to a liberal democracy. Or there could be some sort of counter-revolution. Nobody knows the political future of Cuba – and the result of the American presidential election is likely to be a crucial variable – but it is widely believed that the present model is unsustainable. 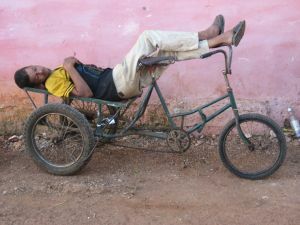 The Cuban people are wonderful. 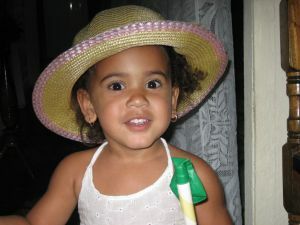 They are a real mixture ethnically with whites descended mainly from the Spanish colonialists, blacks descended mainly from African slaves, and the mixed-race mulato of various shades of coffee colour. In spite of the crushing poverty in which many of them live, most are irrepressibly cheerful, willing to engage with travellers, and ready to dance at the slightest hint of a rhythm. Yet Cubans live in a political system that subjects them to a host of restrictions. At the time of our visit, these restrictions included a ban on Cubans owning a mobile phone, a computer, a microwave or a DVD player or renting an Internet connection or a car or staying in a hotel. However, all these particular restrictions were lifted two weeks after our return in the first evidence of liberalisation measures from the new President Raúl Castro. People still cannot strike or protest and there is no independent media. Education is steeped in political propaganda and political influence at work is substantial. The housing stock is too small and buildings of all kinds are literally falling apart. While cement and sand is cheap, paint and wiring is very expensive. Transport difficulties are chronic. Few people have a car and it is usually something from the 1950s for which spare parts is an eternal problem. Buses are too few and too old, although the Chinese have just provided a new fleet. Those Cubans who have managed to make or acquire some money find that they cannot invest in their own country while foreigners can. Political supervision is tight. The police have the finger prints of every Cuban over the age of 16. Committees for the Defence of the Revolution – as well as carrying out social and propaganda work – keep an eye on local residents. Although accommodation, health care, education and even burials are all free and most Cubans pay no tax, the biggest single challenge for people is economic. 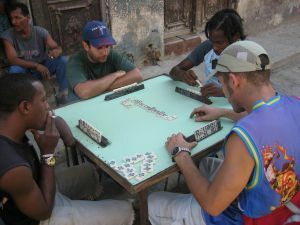 Salaries are paid in Cuban pesos and typically range from 400 pesos a month for a factory worker to some 700 pesos for a doctor. This represents about $17-$30 at the unofficial exchange rate (or about £9-£15). The whole economy is run on a cash basis with no credit and, even as tourists, we found it very hard to use a credit card. There are subsidised official rations which each month comprise 5lb (2.5 kilos) of rice per person, half a litre of cooking oil and, when available, beans, sugar, sardines, pork, chicken, soap and toothpaste. The daily struggle for survival is what Cubans call “la lucha” (the fight). In fact, people only survive through remittances from abroad, unofficial businesses, and widespread corruption. Technically there is no unemployment and there are jobs unfilled, but in fact 'voluntary' unemployment is substantial and there is no unemployment benefit so people have to survive as best they can. It is no wonder that so many Cubans want to leave the country and over a million have done so. However, Cubans do not have a passport and they cannot travel abroad without a letter of invitation and paying an expensive fee. In spite of these restrictions, some 40,000 a year are leaving the country one way and another – often the most educated and enterprising. Cubans are desperate for change – but also fearful of it. They do not want to lose their culture in a tsunami of American tourism and investment. The timing of our holiday in Cuba was most fortuitous: just weeks after the retirement of Fidel Castro and a couple of weeks before the first liberalisation measures announced by Raúl Castro. It may well be that the Cuba we saw is about to disappear. 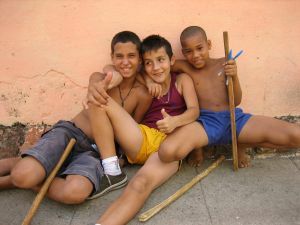 What hopefully will remain, whatever happens politically and economically, will be the Cuban joy of life with its passion for music and dancing. Meanwhile there is an overwhelming sense of waiting – waiting for change - but near total uncertainty as to when and how change will come and what it will deliver and mean.